Federal Black Cloud shotshells are a waterfowl hunter's best buddy. These 2-3/4" shells a one ounce mixture of sharp-edged Flitestopper pellets and conventional #3 shot (both of which are made with waterfowl-compliant steel) at a muzzle velocity of 1,500 feet per second, knocking birds out of the sky with ease. 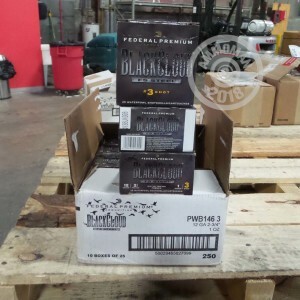 Black Cloud shells are loaded in Anoka, Minnesota using the FliteControl wad, a rear-breaking, tight-patterning design renowned for helping hunters make clean kills at extended range with shotshell loads. Buy a few of these 25 shell boxes or mix and match--all orders over $99 at AmmoMan.com ship for free!